You want to know something crazy? I’ve had this easy spring mantel post sitting in my drafts for almost three weeks now. It’s just been hanging out there, waiting to be posted and eagerly hoping to get out the drafts folder one day. Yet I continued to pass it up, moving it down the list for other “more important” posts. I actually forgot it was even there. That’s wasn’t very nice of me, huh? But the day has finally come for this little mantel to be brought out of the shadows and into the world. Now, when I say this is an easy spring mantel I really mean it folks. This is super duper simple, BUT the whole reason I created this post was to show you all this insanely cute vintage can I found. This little guy was hiding in my parent’s shed in their stash of soon-to-be-yard-sale-things. 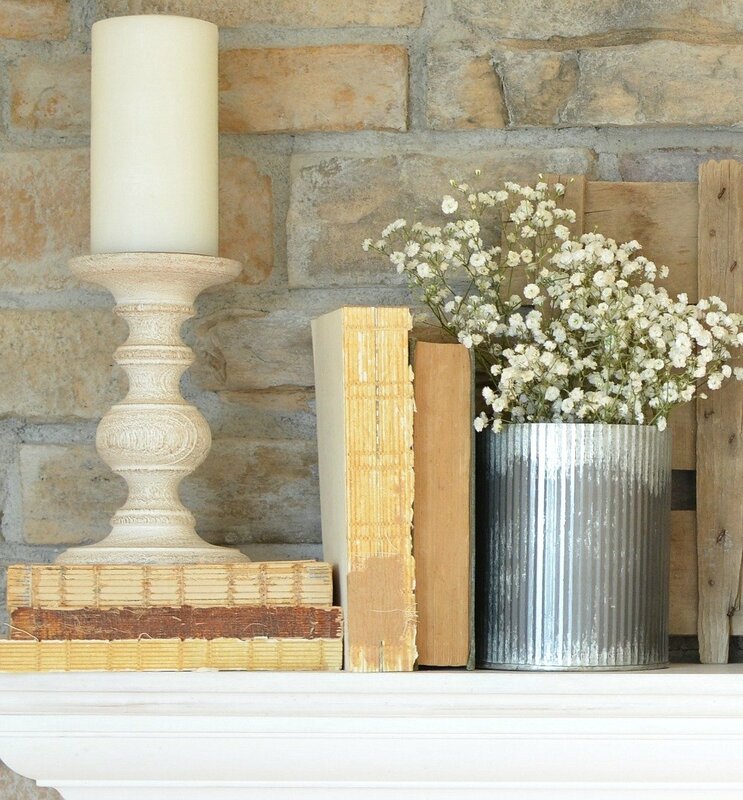 I’ve never seen an old can quite like this one, so I snatched it out of their pile, brought it home, dusted it off and styled it in this simple spring mantel. Just look at how cute this little can is! I did a little Googling and I think this dates back to the early 1920’s. The really unique thing about this is that the paper label is still intact–which is pretty rare for an old can like this one. It also has an awesome tin lid, but I took that off so I could put flowers in it. And I have to say, for as old as this thing is, it’s still in really good condition. Apparently Chase & Sanborn’s Coffee was created in 1862 and they claim to be the first coffee company to pack and ship roasted coffee in sealed cans. Pretty cool stuff if you ask me. 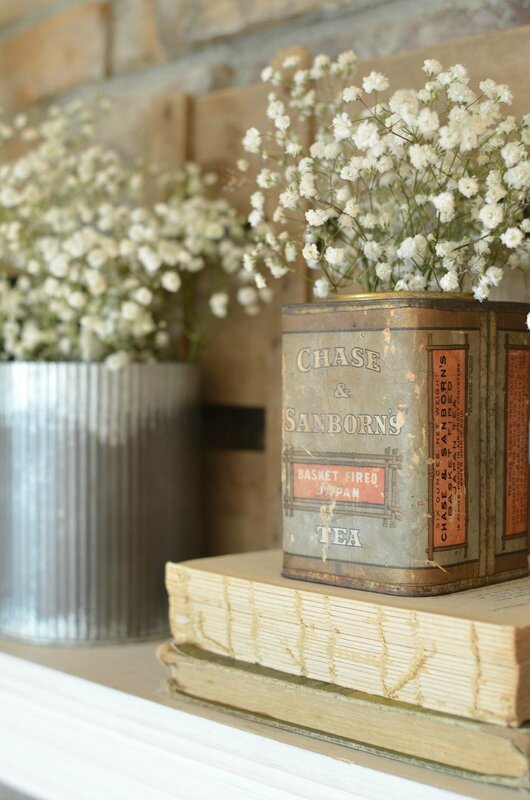 I mean, what’s not to love about coffee (or tea in this case) and a vintage can? Do you guys ever watch that show on PBS called the Antique Roadshow? The concept is pretty simple–people take their antiques into these expert appraisers, who tell them what their stuff is worth. It’s thrilling, let me tell you. I started watching it back in high school and I can remember being fascinated by all the old treasures people would bring in–some of which is worth thousands of dollars. It’s pretty cool stuff if you’re into antiques and old things like I am. And what’s funny is that I’m always thinking of that show when I’m out at garage sales or browsing Craigslist. Or in this case going through my parent’s yard sale junk. I’m always like, “There could be a hidden treasure worth thousands here. Don’t overlook anything Sarah!” Oh it’s possible my friends. Even something small like this vintage can, you just never know. It’s always the weirdest, ugliest things that bring the most money. I once saw a rather hideous pink rocking chair from the 1950’s go for $1500. FIFTEEN HUNDRED. Crazzzzzy. Anyway, I’m rambling now about the Antique Roadshow, but I guess my point here is that antiques are cool. Really cool. So if you have an old can like this one hanging out around your house, get it out of the cupboard and put it to use. I bet you’ll love it. 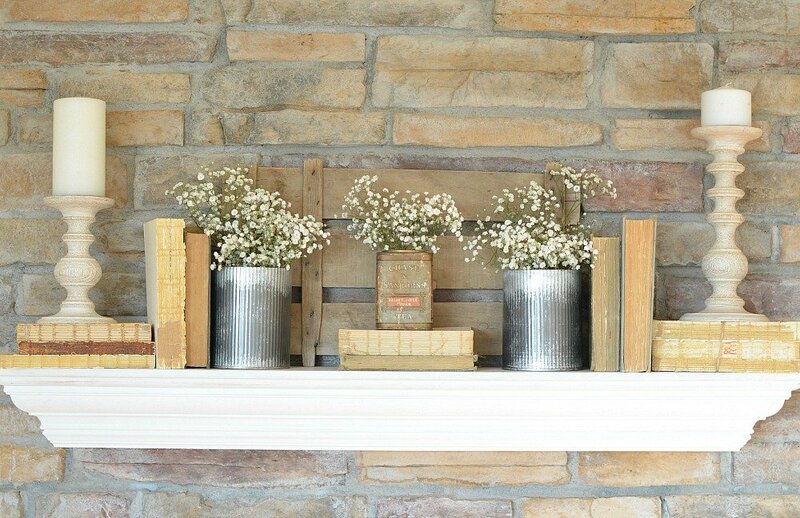 I hope you liked this simple spring mantel! Let me know if you have any questions–I’d love to chat! Where did you get the cute metal tins? 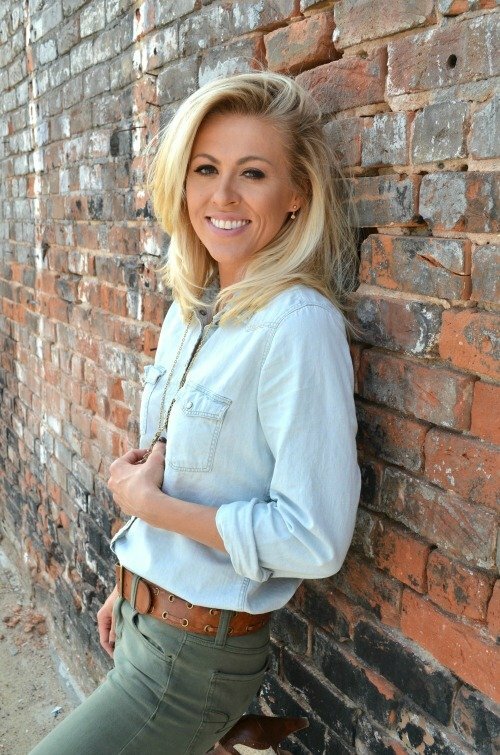 Hi Jennifer, those metal canisters are from Magnolia Market! I like that show too, and have thought the same thing! Maybe one of these things could make me rich?! ???? Exactly! It’s going to happen one of these days! 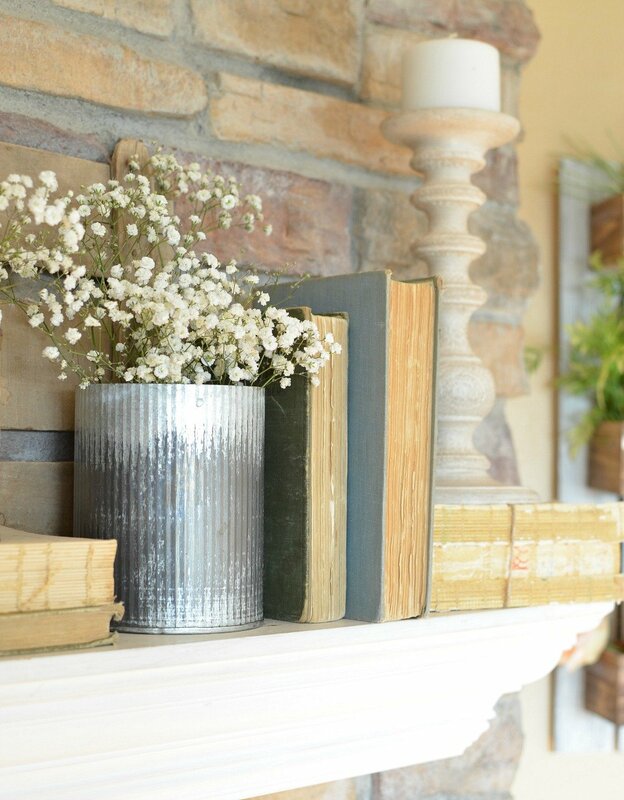 Love the tea can and how you decorated the mantel, I get so much inspiration from you! 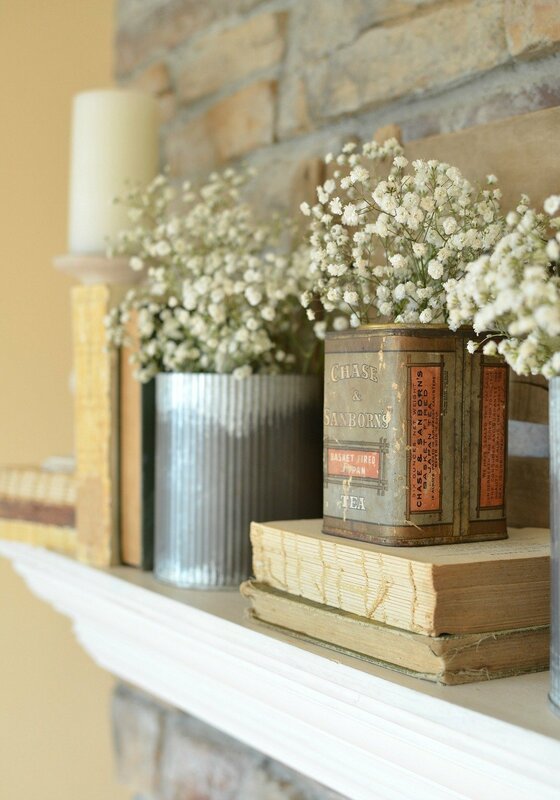 Love the tea can and how you decorated the mantel, I get so much inspiration from you! Love how! Thank you so much Rondell, I really appreciate that! Oh that’s awesome Kim! And now that you mention it, I think my Granny did the same thing with a few small tin cans she had back in the day. Always repurposing! I couldn’t agree more Patty, I love finding treasures in other’s junk! And it sounds like you have found yourself some pretty cool crosses–a shadow box is a great idea for those. Thanks for dropping by today!! Love this and LOVE that tea can!! Great find! 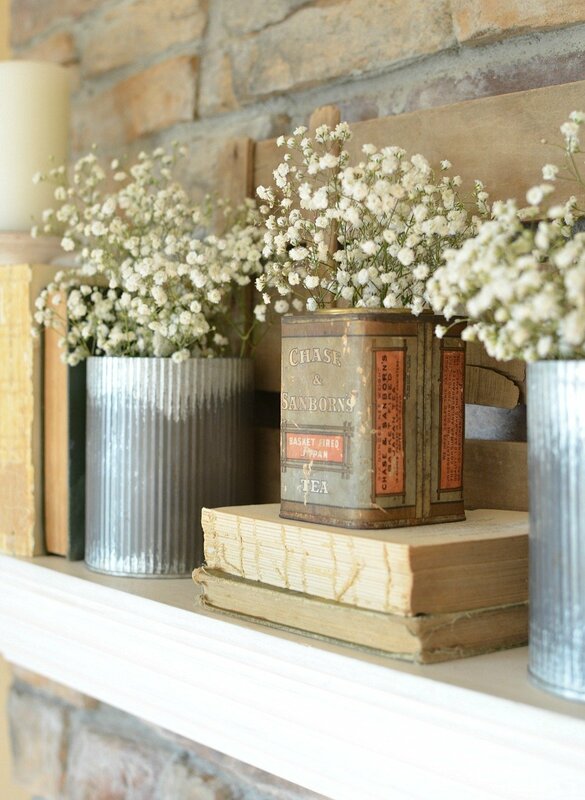 I am on the hunt for Baby’s breath…Hobby Lobby did not have any. Suggestions as to where to find it?? Thanks! Thanks Deanna! 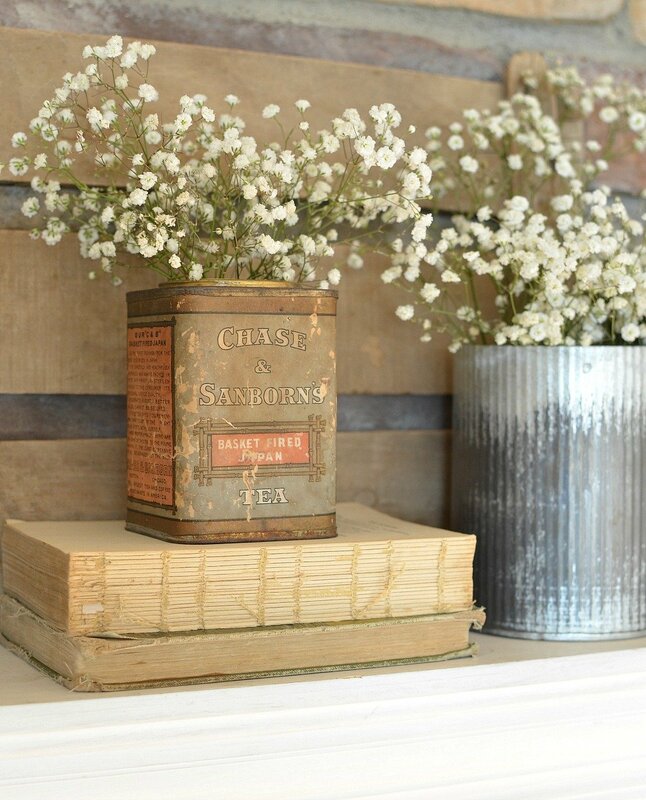 I always buy my baby’s breath at the grocery store–it’s usually only a few bucks a bundle! 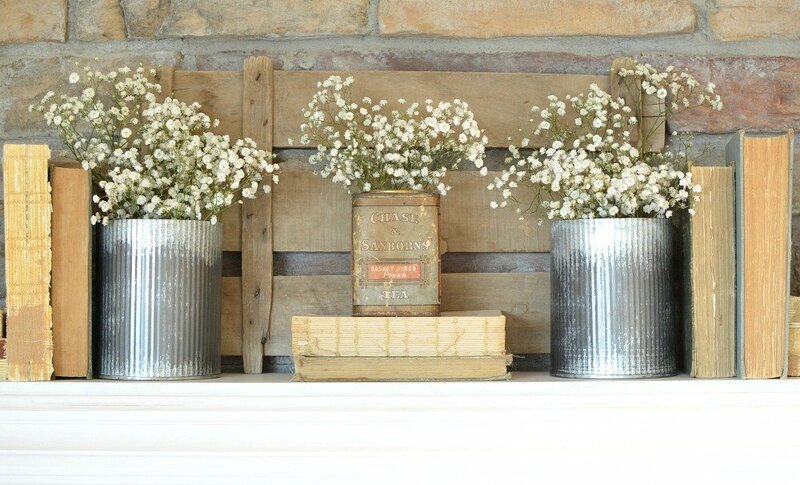 How do you keep the baby’s breath freshest, longest? Ugh….that vintage can is seriously speaking my love language 🙂 I love it!!!!!!!!! What an amazing find. It looks perfect on your mantel for Spring!